At Bayshore Guest Home & Gardens, the compassionate care we have provided for our patients has not gone unnoticed. Please take a moment to read how we have made a positive impact in the lives of our patients and their relatives. Do you have a story you would like to share? Please contact us and share with us your Bayshore experience. We would love to hear from you! My mom has been living at Bayshore for several years. I come randomly because I live 2 1/2 hours away. Each resident gets care above and beyond. The staff are kind, loving, caring, and treat the residents with respect. Whenever there has been a healthcare issue with mom they handled things immediately, professionally, and appropriately. This place deserves a 10 Star Rating as there is no other place I know of that gives the level of care to their residents as Bayshore. Thank you Leslie and Staff for taking care of my mom. You treat her as if she were your own mom and what more can you ask for. Bayshore is expanding and for those that are looking for a Quality Affordable loving facility in Nokomis, Florida this place is a must see. Along with the rest of the staff at Bayshore guest home and gardens have exceeded all my expectations of care towards my father 80 six-year-old 3 and war veteran who is suffering from dementia Leslie has made sure that my father’s needs have been her top priority in every aspect I am app solely happy satisfied above all measure and gratified that my dad is being taken care of so well it takes the load off my shoulders I know is happy and they’re doing everything they can to ensure that we remain so I really am thankful for Leslie and the rest of the South at Bayshore Gardens bayshore guest homes and garden thank you Lesley thank you so very very much. Bayshore Guest Homes and Gardens has been a haven for my mother and our family. I found Bayshore through A Place For Mom. They suggested Bayshore and two other places that could fit her needs. My wife and I visited their suggestions and Bayshore was the best place for my mom, hands down. Over the past two years I have visited mom at all hours of the day and evening and I have always been pleased with the staff and the living conditions of the residents. I often find staff doing tender and loving things with the residents as if they were their own family member. I know that my mom is safe, clean and well taken care of and she is living in a home setting that is warm and caring. Leslie Ann is the administrator and I respect and appreciate her management style. Our family trust her without question because of our individual experiences with her, the staff and the residents. She is a “no nonsense” person when it comes to the treatment and care of the people in her charge. The primary objective at Bayshore is the care and dignity of the family members we leave to be cared for by the staff. It is a home atmosphere from the moment you walk in and experience the smell of fresh food being prepared for the residents. I’ve eaten with my mother several times and it’s real home cooking, not the usual institutional type of food. I will also tell you that I have gotten medical updates on my mother’s health on a regular basis after the visiting doctor and nurse made their exam of her. Bayshore has received several awards for their exemplary care and administration of their duties on behalf of the residents. They are a model that many other ALF should follow. I sleep well at night knowing that my mom is sleeping well too. That is piece of mind. Thank you Bayshore. I placed my mother in Bayshore Guest House a little over a year ago. Before that she was in a large well known facility, No one checked on her to see if she had even come down for meals or how she was doing. I had know life and constantly running over there to check on her. Bayshore has changed that not only is she looked after and safe, she is loved and treated like a family member. And most importantly mom is treated with DIGNITY. I for one am very grateful for Leslie Ann and her high standards. Also to the loving staff, and to Monica for creating such wonderful place for these people to live out their lives. After enduring poor care for our Mother at two other local assisted living facilities, we were extremely fortunate to find Bayshore Guest Home and Gardens. The staff that we worked with were very caring and attentive to the residents’ needs. Leslie Ann, the administrator, is a true saint, and I am grateful to have her in my life. The facility is clean and well-maintained, and the home cooked meals are second to none. Residents are bathed daily and meticulously groomed. The ratio of staff to residents is also superior to that at most facilities. 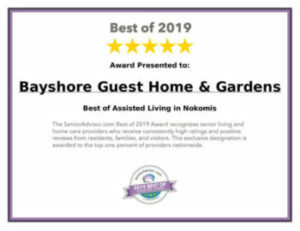 I wholeheartedly recommend Bayshore Guest Home and Gardens to anyone in the position of needing quality care for a loved one. As a third party provider, I’ve been in and out of this facility over the last several years. It’s one of the homiest places in the area. Stellar care. Leslie Ann has never tolerated anything but the best care for her residents. The core staff are fantastic. The newest activity is art classes for the residents. How cool is that? As a registered nurse, I would feel blessed to use this little jewel for one of my loved ones. I am writing this review in honor of my mother who lived happy and safe at Bayshore until her passing. She would want me to say how much she and our family so much appreciated the warm and caring love that she received. From my initial tour and sit down conversation with Leslie Ann I know right then and there that Bayshore was the perfect home for mom and for us. Leslie Ann made ABSOLUTE sure that ALL my mother’s needs were taken care of right up until her final breath and that our family could rest assure she would be taken care of with respect and love……and she was!!! The staff is exceptionally kind, understanding and very polite. The food and home cleanliness was perfect. Thank you all at Bayshore Guest Home for making my mothers life so much more happier then if she had lived in a “facility” where she was lost in the crowd. My mom has been a resident at Bayshore for about a month. When I first visited Bayshore I found it be be a homey in environment and the staff to be friendly and caring. I was welcomed to stay overnight and although I did not sleep well i did find out that the overnight staff was a working staff caring for the residents around the clock. The overnight staff made sure the place was clean and prepared food for the residents for the following day. The staff at Bayshore work as a team helping residents. They encourage residents throughout the day and give them the personal care they need. When visiting mom I enjoy assisting in the activities. Bayshore is a small intimate Assisted Living Facility that I highly recommend to families who,have a loved one who needs more one to one care and yet feel like they have independence. Although my mom has only been there a short while I don’t know of any other facility I would rather see my mom at. Bayshore is a very special place and I thank God for providing this place for my mom. Also a special thank you to Leslie who not only cares about the resident. She also cares about the family members and their well being. Thank you for giving me an opportunity to share my experience. In the process of relocating my Mom from an ALF in Venice to Bayshore Gardens. The facility is clean, professionally run and has well trained staff. The residents get care beyond the state requirements and home cooked meals. The Administrator Leslie Ann is fabulous and has fought hard to make this transition happen for us. Truely thankful to have found a good place for Mom. Bayshore Guest House creates a safe, homelike environment. My mother moved into Bayshore Guest House & Gardens in April of 2014. She was a mess. She nearly died living alone in her home in Northport. After time in the hospital and then rehabilitatiion we were able to place her in Bayshore. Her health was extremely fragile and she was overweight. The staff at Bayshore gave her an excellent evaluation and developed a strategic plan for her. She began eating their nutritious meals. Her numbers started heading toward normal. Her weight dropped to where it should be. When we have driven across the state to visit her at Bayshore, sometimes announced and sometimes dropping in, we have found the facility clean and the staff very attentive to the needs of all the residents. It is clear that my mother can no longer live by herself. That is why I am so thankful that she is living in a very safe place like Bayshore Guest House & Gardens. Staff is professional. Residents are clean and well-groomed. Facility is very clean. I moved my husband from another assisted living (memory care) facility to Bayshore, and have never regretted it. The atmosphere is homey–not fancy. The caring staff were never too busy to spend time with a resident and were compassionate and kind to me as his condition declined. He was made comfortable, kept clean, and treated with respect, dignity and affection during his entire stay. My Mother was in a assisted living facility before coming to Bayshore Guest Home. What a difference, she smiles now and is happy. The care is wonderful, it really is a family atmosphere. I feel like the weight of the world has been lifted off my shoulders. This is a cozy, home-like atmosphere with a great ratio of residents/caregivers. The people who work there couldn’t be nicer and take excellent care of my mother. I have complete confidence in the care she receives on a daily basis. We toured Bayshore today while looking for a new place for my mother to reside in. She is 88 and needs more one on one attention than what is getting at her current assisted living facility. I found the staff to be extremely attentive to the residents. There is an atmosphere of kindness and caring. Bayshore is a small place which may be exactly what my mom needs. It is an older facility but that does not take away from the good work being done here. Bay shore is a small intimate Assisted Living Facility that I highly recommend to families who,have a loved one who needs more one to one care and yet feel like they have independence. I was impressed with Bayshore as soon as I stepped through the door. The facility was clean, the food smelled delicious, and the residents looked happy and well cared for. It truly felt like a warm and loving home. It was my first choice for my father. The best place to be. Residents are respected and very well taken care of. The home is clean and organized. Beautiful garden. As soon as we entered the door, we were greeted with the smell of home made food and a smile from the staff. Even better was the fact the the residents were seated at the dinning room table being assisted with an activity and more smiles. It is very easy to see that the care given to my mom and the other residents is not just some one going through the requirements of their job but the care that is given is from the heart. I’ve visited several other places and I’m confident that I have made the right decision to have my mom live in a home setting where she feels safe and happy. When we visit my mom, it’s like going to her home for dinner when she was on her own up north. She always took care of us then and now she is being taken care of in the manner that she deserves. She is happy and safe thanks to a wonderful staff at Bayshore. We searched the Sarasota area for a spot for Mom. She was in an independent living place and was failing fast. All the possibilities we thought appropriate were full. A kind nurse told us about Bayshore and the rest is history. From the minute we walked in the door, we knew Mom would be taken care of. The homey atmosphere and caring staff are amazing. Leslie Ann is a true mensch. I have been a Home Health Administrator with All Stat Home Health for over 23 years. During that time we have worked with numerous clients who need placement in Assisted Living Facilities. I have always been impressed with Leslie Ann O’Gorman and her amazing staff at Bayshore Guest Homes and their single minded compassionate focus on the needs of the patient. It is a pleasure to work with people who share your compassion for care and the desire to provide exceptional customer satisfaction! My Husband and I have just recently admitted his Parents into Bay Shore Guest Home. I feel we were very lucky to have discovered this home. The Administrator, Leslie, worked with us very close to make sure his parents would get the best of care. The Staff, are very knowledgeable, professional and outstandingly kind to each and everyone of their patents. We experienced this first hand and that is why chose Bay Shore Guest Home for his Parents. The facility is extremely clean and all the patients are taken care of by showering and feeding them well. There are no words to express how fortunately we were to fine a home that treat all there patients like family. We would highly recommend this Guest Home to anyone and we are confident that they would feel the same as we do. I toured the community and was very impressed with the European family style living. The care plan is individualized by the Doctors and the Administrator, Leslie Ann and her Assistant, Lisa. All the Residents participate in activities, there is music and meals are a family time of sharing. Families are invited to enjoy meals with their loved ones. Having worked with Leslie Ann this does not surprise me…. I hope that we can move mom in as she would love Bayshore and the staff there…Seen many places in the last month and Bayshore has the most staff, running around helping their residents…and by far the most family oriented. Whatever the outcome, my wife and I will always appreciate the support and connecting us with the right attorney. Thank you for all the time you spent on the phone in the evening, your personal time, to help us…God bless you..
My mother passed away at Bayshore at 99 years old. Bayshore coordinated the Hospice care and sat with her and went to the store constantly to buy food she craved…She also loved pasta carbonara that the administrator L.A. cooked for her on a regular basis…I was included in all her care and updated daily in the evening by L.A. I walked in the room one day to see L.A. laying in my mother’s hospital bed , holding her and praying and singing to her….I was overwhelmed with the love in the room and then stayed with my mother as she passed..The staff was a step away and my mother was afforded every dignity at that last chapter of her life…. I am an owner and operator of a home care agency and I am in Assisted living communities throughout the Gulf coast region. I wanted to provide a comment on Bay Shore Guest home. The staff is one of the strongest teams I have experienced. The staff has outstanding skills and nurtures the residents as if the community is one large family. The professionalism and personal touch is outstanding. I like the personal touch points that I see at Bay Shore, each resident is treated like family and I like that every time I come in Bay Shore the residents are engaging and actively doing activities. Bay Shore community is an excellent residence that goes beyond most in the industry and makes your loved one feel like they are at home with an extended family. While looking for an assisted living for my 95 year old aunt in the Sarasota area, it was suggested I look at a small ALF in Nokomis…an area just south of Sarasota. What a delightful visit! The Administrator, Leslie Ann was available to show me around. I fell in love with the grounds, the residents and the caregivers. I have found. her a beautiful new home when she moves to Florida. Thank you Bayshore Guest Home! Staff goes above and beyond. Treats residents as family. As a nurse coordinator in business for 20+ years, I have been in many facilities. I had one of my patients spend several months at Bayshore Guest home. I dropped in to visit numerous times during his stay there. I always saw the staff going above and beyond normal patient care. The staff/patient ratio is higher there than any facility I have ever been in. The staff treats the residents like their own family. As I mentioned, I have been in many facilities, chandeliers and velvet drapes do not make the facility great. The staff who talk and touch your loved one is the important factor. Walk in the door and it feels like coming home! Though small it offers spaciousness and a comfortable, safe environment. Resident families and friends are welcomed and made to feel at home…The staffing is the best I have seen and above the normal ratio. It is unique..I commend the Administrator and all her staff…. My dad moved into Bayshore Guest Home in September. The name “Guest Home” has proved very appropriate, for although you arrive as a guest, Bayshore quickly becomes a home to both the resident and their entire family. Everyone is welcomed with open arms into a very supportive personal setting, in what we all know are not easy times of transition in life. Bayshore offers a clean, bright environment with an attentive caring staff, and an administrator who monitors care closely and is available around the clock. Communication to family both near and far is thoughtful and thorough. Bayshore works hard to attend to not only the physical, and emotional needs of the resident, but reach out to the needs and well-being of the spouse as well. This is clear in their encouragement of spouses to sit down and join in at every meal, and participate in games and musical entertainment activities. Bayshore believes in respecting the dignity of their aging residents and works closely with family to cater to individual requests and concerns as they arise. We feel fortunate to have Bayshore as an extension of our home during this time in my dad’s life. My husband lived at Bayshore Guest Home for just over six months, until his death. He had a devastating type of dementia that robbed him of his ability to communicate. In spite of these challenges the staff was always extremely caring and supportive. They loved him as if he were family and grieved with me as we saw him decline. He loved animals and enjoyed the daily visits from an assorted group of adorable little dogs, all owned and managed by the staff. Bayshore is so homelike — a warm and happy place. I visited every day and always found it to be kept immaculate and the meals always tastefully served and enjoyed. The staff went above and beyond to encourage my husband to eat and even when his disease caused resistance, their patience was endless. I’m very grateful that we had Bayshore so close to home when my husband’s care was too much for me to handle and I recommend it very highly. I visited Bayshore Guest Home to do a book interview and book signing. I was very impressed with the friendliness and professionalism of the staff. The home was clean and the clients were obviously taken good care of by all. I observed lunch time while I was at the guest home and spoke with some of the residents while they ate. They seemed genuinely happy in this setting and spoke highly of the employees. The administrator goes out of her way to ensure that all clients are given an environment similar to their own home. She demonstrates empathy, compassion and sincere concern for all those who need her care. My parents are in their mid-eighties and if they would ever need to go to a guest home I would strongly consider Bayshore even though it is a little further from my home than other places. Bayshore Guest Home is a phenomenal place. The staff is well trained and capable. The environment is comfortable and home-like. A special thanks to staff and Administration: In looking for a facility for my friend and Business partner, several facilities turned us down because of the level of care that was required. Bay shore accepted him and provided exemplary care on all levels. I am advised of all changes to his condition and I am consulted before any changes to his therapies. He is in good hands. These are caring people who put residents first. I would recommend Bayshore without reservation. My grandmother stayed under respite care and we know that when the time comes that is where she will move to. Staff treat residents like their family and take the time to sit and talk to the residents….I enjoyed several meals there and it was home made and lovely. Leslieanne is as one of the reviews said top notch and knows her business, while showering her residents and their families with care and attention…. I want everyone to know what a phenomenal place Bayshore Guest home is. I have placed two clients there and both my families can not say enough good things about Leslie Ann and her team. They have an excellent care and violation history, the community is super clean, residents are happy, engaged and their health actually improves under their care. I will continue to recommend her home to all my clients. Keep up the good work! My mother’s life changed quickly from living alone to needing Memory Care Assisted Living. We were caught off-guard with all that had to be done. We found Bayshore Guest House through a service. We are so thankful we were led to Bayshore. The facility has the feel of a friendly Bed & Breakfast. The rooms where the residents can eat, mingle, and watch TV are quite large. There is a very large back porch that is screened-in and covered for talking together or reading. (A smart decision is that the washer & dryer are located outside the house and in a protected corner of the porch. They are quiet and eliminate a hazard by having them outside the home.) There is a beautiful Butterfly garden in the back to walk in or sit on a bench. My mother is getting the medical care she requires every day. Another benefit is that the food she is eating tastes good. Mom’s blood sugar has become “more normal,” requiring her to have insulin shots once a day or every other day instead of twice a day. Mom has also lost weight & inches, but is getting stronger each day. Leslie Ann is an excellent administrator. The staff is quite friendly. They also exhibit a high level of professionalism that we appreciate. People living in a ALF like Bayshore need monthly supplies. The staff members keep family members aware of what the resident needs. We recommend Bayshore Guest House highly as a place to have your family member live and thrive as they go through this challenging change in their life. My name is Jason Hutchison im a firefighter emt that does all of the CPR anf First Aid classes for Bayshoreguest homes. The staff there are friendly welled trained and very knowledgeable and leslie Ann is a wonderfull person who puts her residents safety and care first an overall loving an warm places to have a loved one stay at. Bayshoreguest homes also has a great relationship with Nokomis Fire Dept who has also came there and done fire safety classes thats why the laundry is done out side so its not a fire safety issue and the residents dont have to hear the washer and dryer running all the time. I teach at a lot of other facilities bayshoreguest homes by far is best place i,ve taught at. Bayshore is a warm and friendly place with neatly kept and smiling residents. Leslie and her staff are top notch! I can sleep at night knowing our loved one is safe and cared for with kindness and understanding…Bayshore is a hidden jewel!! My Dad was a resident of Bayshore Guest Home during the many months it took to empty his home and prepare my home for his special needs. The facility was bright, roomy and impeccably clean. The staff, from resident care professions to management, were outstanding. They took special care to provide personal, attentive service to their residents and create a friendly family atmosphere. I felt the level of professional care given to my Dad was excellent. Although my Dad is no longer at the facility he has wonderful memories of his time there. I would highly recommend Bayshore Guest Home to anyone needing to have care for family members. I am a social worker who has lived and worked in the Venice area for a number of years. Bayshore Guest Home and Gardens is an excellent small and home-like assisted living facility for the elderly. They are extremely clean. Food is out of this world-like Mom used to make! Staff are courteous, professional, well-trained, and caring. Care of the residents and their needs comes first. If she was alive, I would place my mother there. The most remarkable and refreshing aspect of Bayshore Home and Gardens is its “anti-institutional” feel. My mother and the other guests there during my mom’s stay were always treated more like members of a family, in a true home-like environment. I observed highly personalized attention, joined in intimate meals around a family table, and witnessed frequent conversation and attention between staff and guests. And I was always welcome there as well. It’s a relaxed setting, very clean, great swimming pool, and lovely grounds. Leslie-Anne and her team respect their patients on a very personal level. At the same time I found the level of professionalism among the caregivers beyond reproach. Leslie-Anne is obviously very experienced, and really knows the details of her business. The team is procedurally buttoned up, and well-connected to a range of outside resources such as hospice, and local physicians. They have their act together. My mother spent her last year at Bayshore, and honestly I can’t imagine her receiving more loving or professional attention during that time anywhere else. I’ll always feel a sense of gratitude toward the staff for their grace and the terrific care they gave her. I just visited Bayshore last month and had a wonderful experience. I found the staff to be friendly and very accomodating. I spoke with Leslie Ann, who I found to be very knowledgeable. I discovered that she was an RN for 8 years in Europe before coming to the US. I am kind of surprised at the poor review one person gave this facility. I was happy to see the laundry area away from the resident rooms and recreation spaces, as laundry is done all day and all through the evening – bedding is changed daily. As far as the staffing goes, I know they are above the standards because even larger facilities are only required to have one person on at night. All the residents seemed very happy and I like the “home” feeling of the place – I would encourage anyone interested to visit – They have always had excellent ratings on state inspections! I can’t begin to say enough good things about Bayshore Guest Home. First It is a “home” not a “facility”. Second all of the staff are soooooo very caring and you can tell from their eyes when they look at a resident how much they truly care. The food is so good that I would like to move in myself. They make the food there and it is always something new and different – but definitely delicious. Bayshore have volunteer’s come to read to the residents – and there is live music. The TV programs are monitored so that only happy shows can be aired – not war movies or other upsetting programs. I could go on and on – but I will stop here and will say that I feel totally blessed to have found Bayshore Guest Home – there isn’t a better place on earth for a loved one to live.